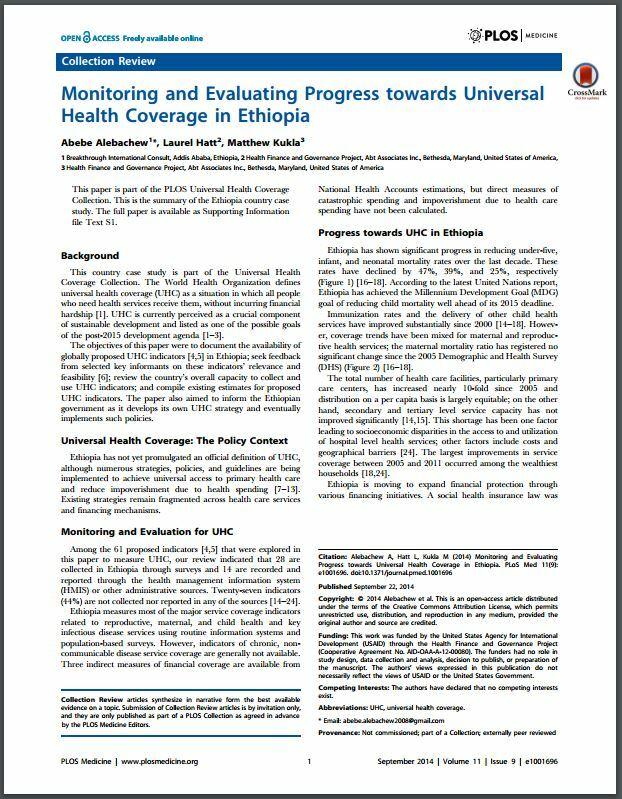 PLOS Medicine’s newly released Monitoring Universal Health Coverage Collection features an HFG country case study on the availability of globally proposed universal health coverage (UHC) indicators in Ethiopia. The study, “Monitoring and Evaluating Progress Towards Universal Health Coverage in Ethiopia,” explored 61 proposed indicators and found that 28 are collected through surveys and 14 are recorded and reported through the health management information system or other administrative sources. The study also found that while Ethiopia has indicators that measure service coverage, progress lags in terms of indicators for chronic conditions. Also, data are not available in country for the financial protection indicators. The authors concluded that some of the World Health Organization’s proposed UHC measurement indicators may not yet be appropriate for low-income countries. Local stakeholders suggested that indicators more relevant to their country’s context would be most useful.